It’s not easy coming to a new club when your main purpose is to dislodge the team’s ever present Player of the Year from the previous season. It’s even tougher when you’ve made the move across country to do so. 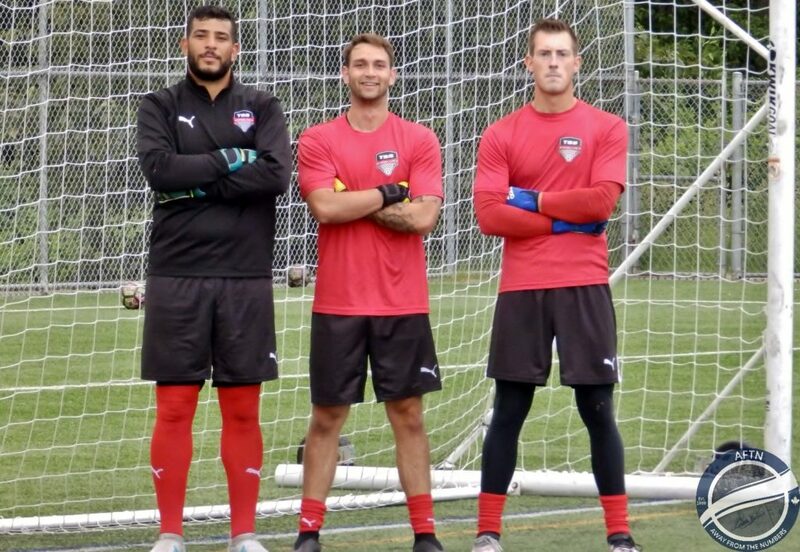 But that’s exactly the situation new TSS Rovers goalkeeper Mario Gerges finds himself in as he undertakes his first PDL season with the club after heading westward from Quebec. 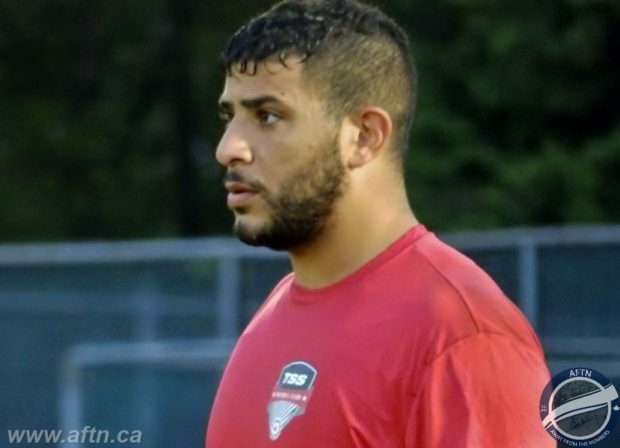 While many on the Rovers roster this season will be well known to followers of the local scene, either from their time with TSS last year, playing for one of the local colleges or amateur soccer league teams, or their journey through the Whitecaps Residency program, the 22-year-old Gerges will be a name unfamiliar to many here. But the Montreal native is certainly no stranger to BC or to a number of players on the current Rovers squad. 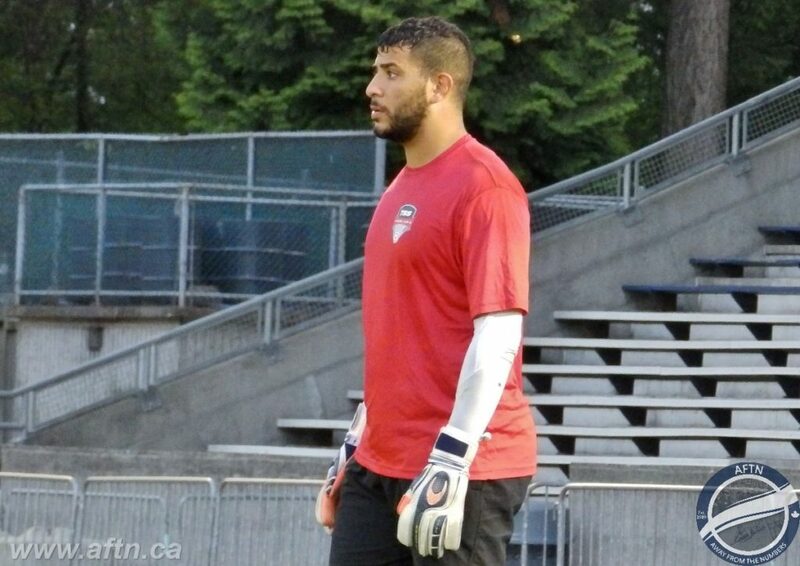 Gerges was the starting keeper for Metro Ford that season, but was forced to miss the nationals due to being called up for a Canadian U18 training camp in Guatemala. A bitter sweet call up really, but it was a season of memories and long lasting friendships made, including those with a couple of now TSS teammates, Marcello and Matteo Polisi. His former coach Nash, the Whitecaps captain in their USL days pre MLS, played a role in securing Gerges his place on the Rovers’ roster this season, so did some of the current Rovers, and a player who was with TSS last year, Mamadi Camara. It’s those recommendations that coaches Colin Elmes and Will Cromack have used a lot to build their squads these past two seasons and they’ve been delighted with that they’ve seen from Gerges so far and what he offers the group both on and off the pitch. “He came to us, as a lot of these things do,” Elmes explained to AFTN. “I think you’d be surprised how many times in football that the current player group, core players, come to you and say ‘you need to look at this guy’. So he came recommended by a few of our guys that we know and we trust. It’s that last part that’s the key. Gerges isn’t just here for the summer to reconnect with old friends, stay with his brother downtown, and hang out. He has his eye fixed firmly on the prize and that prize is becoming a professional footballer. The big stopper spent last season playing with Dynamo de Quebec in the Première Ligue de soccer du Québec, playing 1215 minutes and having a goals against average of 0.96 as the team finished second. All well and good but he wants to play at a higher level and be more challenged, and Gerges feels that TSS is the perfect shop window for him to achieve that. Gerges’ journey to TSS is an interesting one. One that has seen him on the cusp of a pro career before circumstances changed. 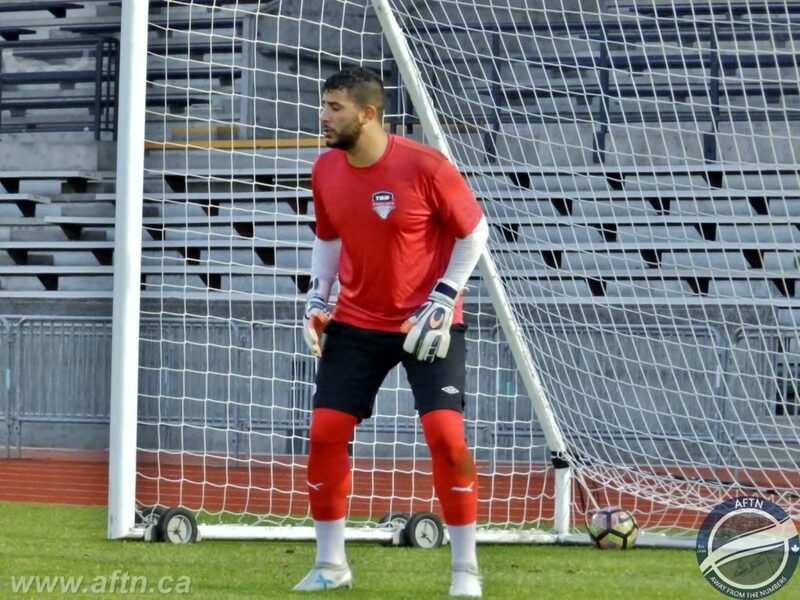 The keeper spent the 2014 college season with the University of Montreal Carabins, heading to the nationals as a starter in his freshman year. But the desire to be a pro loomed large and Gerges left college for the Montreal Impact, taking his place on their USL side FC Montreal’s roster for the 2015 season. The Impact afforded him the opportunity to get a taste of the pro game and train at times at the top level, and that’s the drive that’s brought him to BC this summer. “I was there for the end of one season and the beginning of the next,” Gerges explained. “I used to train with Piatti and players like that so that game me experience with big players. Being there was amazing and I could almost touch being pro. Like many on the Rovers roster, the impending Canadian Premier League on the horizon has been a game changer. Now those dreams of being a pro footballer are no longer so limited or requiring a move out of the country, and that’s another big reason behind Gerges heading back to British Columbia. “I came here because there’s more opportunities,” Gerges explained. “I saw the eight teams that are going to be in the CPL next year and there’s no Quebec team, not even in Montreal. Basically you need a lot of money and I don’t think Quebec is ready for CPL, so that’s why I came here. Standing in his way at TSS this season are the formidable obstacles of Andrew Hicks and Luciano Trasolini. The goalkeeping ranks at the Rovers are stacked this year. Hicks is returning as Player of the Year, on the back of coming within five seconds of winning a BC Provincial Cup with Langley United. He’s hungrier than ever and wanting to perform even better than last season to earn his own pro deal. Trasolini has just arrived into the group, ahead of making a NCAA college switch to SFU Clan for the coming season. The Whitecaps Residency alumni comes with a strong reputation and a proven track record both at club and international level. All three want to be the number one and all three want minutes to show what they can do, and it’s exactly that kind of challenge and competition that drove Gerges to come to TSS this summer. “It’s hard to be a keeper you know, because there’s only one position,” Gerges admits. “They told me before I came here that Hicks was the best player from last year, that he was good, and stuff like that. But I told them, I need someone to push me up if I want to be better. If I’m going to get to that next level. Gerges has impressed so far in training and the two halfs he played preseason, where he kept two clean sheets. His distribution is excellent, adding another attacking option to the TSS bow, and you can see the desire he has even when playing training scrimmages. Rovers fans may be used to seeing the ever-present Hicks in goal, but expect Gerges to get some playing time soon. “He clearly has the goalkeeper attributes and the size,” Elmes said of Gerges. “I think he’s 6’5”, but as big as he is, he’s quite comfortable with the ball at his feet and his distribution is very good. He’s hit some sidewinder goalkeeper punts, low trajectory stuff, out to our wide players. Both in games and at training and been pretty precise with that. If you haven’t already got your season tickets to see Mario and the other lads play, what are you waiting for?! It’s the best value soccer you’ll find in the lower mainland. Get them HERE and if you can’t make it along to every match, the club have a donate a ticket scheme where you can help someone who can’t afford a ticket make it out to a game. The first match is this coming Monday against Lane United. Be there!